Sonko to fight Peter Kenneth if Jubilee decides as what the president endorsed. - Bana Kenya News, Real African Network Tubanane. Home featured Nairobi Sonko to fight Peter Kenneth if Jubilee decides as what the president endorsed. Sonko to fight Peter Kenneth if Jubilee decides as what the president endorsed. 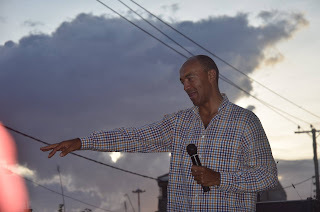 President Uhuru Kenyatta endorsing Nairobi Gubernatorial aspirant Peter Kenneth for Jubilee ticket to compete with the incumbent Dr Evans Kidero has backfired in the party due to the tyranny of numbers. The Kamba community in Nairobi has said to back Kidero in the coming elections if Mike Sonko will not be on the ballot coming 8 august. Peter Kenneth and Mike Sonko have been in a fight within the Jubilee party. The Nairobi senator yesterday said that he will not work with Peter Kenneth and they will need to for nominations. " We had no consensus and only Nominations will tell who is the favourite. President endorsing PK does not make any difference to my people. If the Jubilee insist that PK will have the Ticket then he needs to prepare himself for a massive failure. I will rally against him in all corners of Nairobi and Kidero will get three-quarters of votes in Nairobi." " I will make sure that only Kikuyus vote for PK in Nairobi and the rest go to Kidero. The Jubilee party should realise that winning in Nairobi is all about numbers and development not being handsome, good posture or even international guests. The internationals have no votes in Nairobi." Added Sonko. The current Governor was given ODM direct ticket in Nairobi. The other parties in NASA will all back Kidero in the coming election. The incumbent governor already has the numbers if Peter Kenneth will be the Jubilee Aspirant. The western, Nyanza, Eastern, Coast, North-Eastern communities living in Nairobi agreed to back Kidero in the coming elections. The Jubilee party must think in terms of getting more votes, but not presentation. Presentation towards international is a personal effect and can be changed. If Jubilee party emphasises that Peter Kenneth should hold the party ticket then it is expected to have a massive fallout in the City as the critics say.